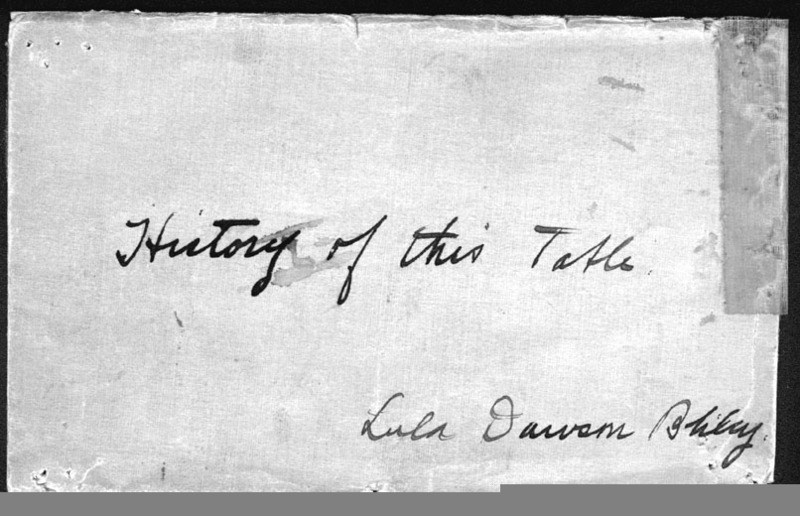 Note Two -- From an unknown author describing the lineage of Mary Elizabeth Sloan apparent initial owner of the table. It is a small table that has traveled through the hands of five generations. It was built for Mary E. Sloan Hall, later Brown, then passed on to her daughter Alzina Hall Dawson, then to her daughter, Lula Dawson Bliley, next to her daughter Josephine Bliley Oldham, and finally to Josephine's niece Jean Marie Bliley Everberg. In July 1974, Jean Marie Bliley Everberg was given a small table shown below. It stands about 36 inches high, is approximately 22 inches wide and 18 inches deep. The color light honey brown common in American Maple wood. Shown below are four photos of the table in the Year 2000 in her home in East Hampstead, New Hampshire. The knobs are not the originals, which are believed to be plain white-porcelain ball types with brass hardware. Within the table drawer was a small envelope (5-1/2 X 3-1/2 inches) thumbtacked to the bottom of the drawer. 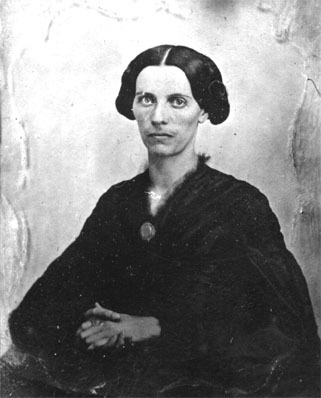 It contained a small linen card (3-1/4 X 5-1/4) and a photo of Mary Elizabeth Sloan, the women who first owned the table. 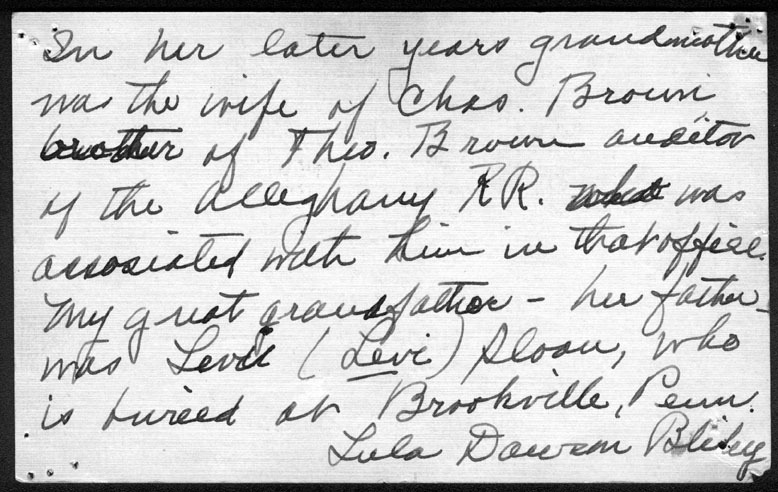 Lula E. Dawson Bliley, the grand daughter of Lula Dawson, signed the envelope. 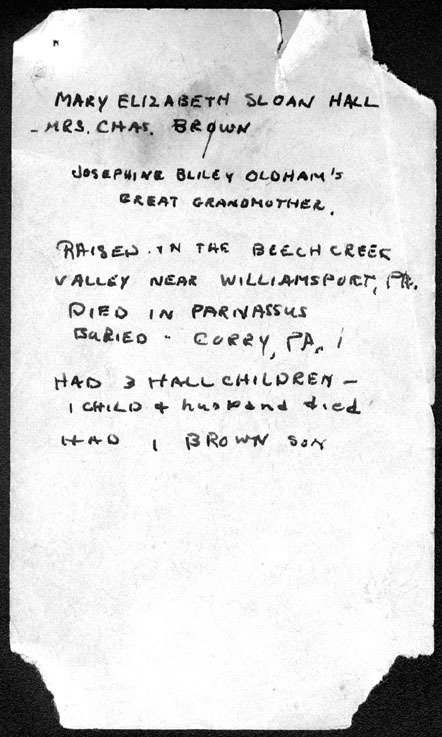 The note is written to Lula's daughter Josephine Bliley Oldham. 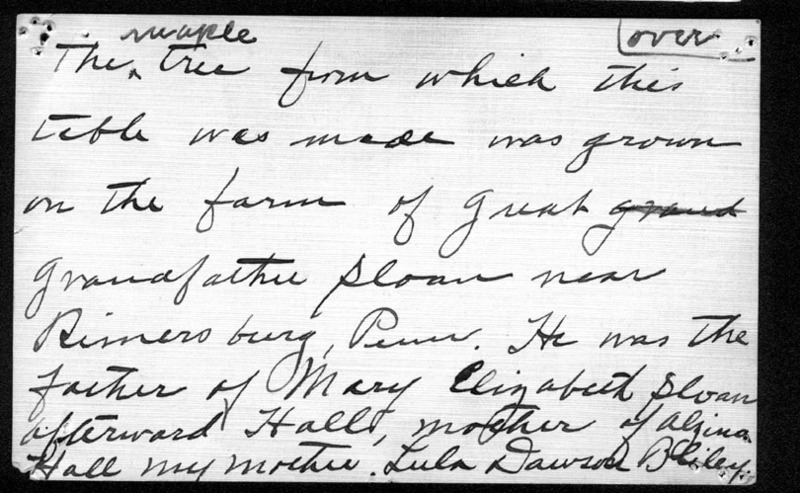 There was a second note, apparently created later by someone else to elaborate on the lineage of the family members. All of these items follow in this document. "The Maple tree from which this table was made was grown on the farm of great grandfather Sloan near Rimersburg, Penn. He was the father of Mary Elizabeth Sloan afterward Hall, mother of Alzina Hall my mother. "In her later years grandmother was the wife of Chas. Brown brother of Theo. Brown auditor of the Allegheny R. R. was associated with him in that office. My great grandfather - his father - was Levi Sloan, who is buried at Brookville, Penn. 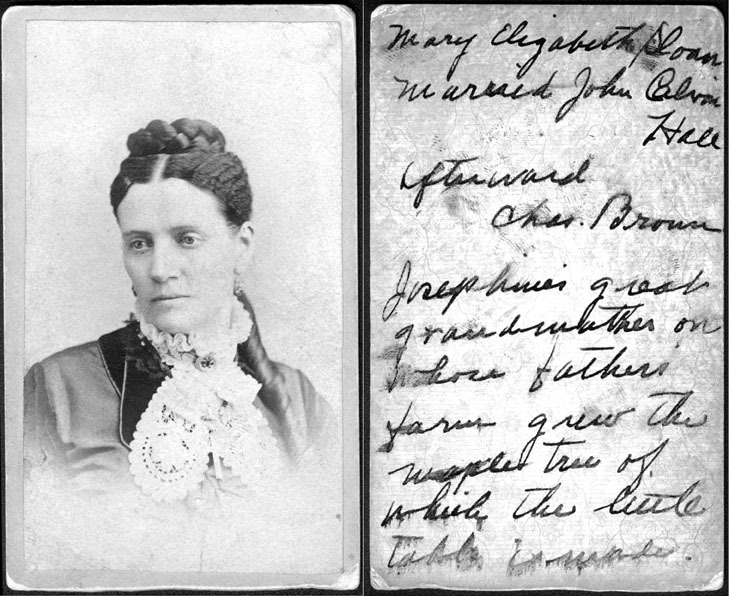 Raised in the Beech Creek Valley near Williamsport, PA.
Below is a photo of Mary Elizabeth Sloan, whom we believe to be the original owner of the table. thumbtacked to the table drawer. of which the little table is made." NOTE: The "Josephine" is Lula Dawson Bliley's daughter. In Lula Dawson Bliley's personal family album (circa 1930), there are several photos of Mary E. Sloan. Below is one of them as a much younger woman that the one from the table. Several photos of Mary can be found in Lula's album on Page 14. John Calvin Hall, and one child. Within a few weeks. Afterward married to Chas. E. Brown"
To the left is a small children's rocker that I believe was made by the same person that made the maple table. The vintage, wood color, and craftsmanship are the same as the table. Clearly, it is not a factory-made chair. It could have been made from scraps of wood left over from the table project. There are some teasing similarities in the grain of the wood, but nothing that matches perfectly. This chair was used in the home of Frank Dawson and Isabelle Marie Bliley on Arlington Road in Erie, Pennsylvania between 1940 and 1996. In fact, Jean Marie Bliley Everberg, the current owner of the chair and the maple table, often used it. All of the grandchildren also enjoyed the rocker. Jean has a strong recollection that she was told that it was the property of our grandmother, Lula Dawson Bliley, who used it as a child. Lula is the grand daughter of Mary Sloan. That would mean that four generations have used the chair and it is still in one piece! What do you think are its likely origins? Between the front of the arms 12 3/4"
Front of rocker rails 12 1/4"
Rear of rocker rails 8"
Length of rocker rails 18"
Distance from end of arm rest to rear of back 11"
NOTES: The fabric on the chair's seat is not original.